A troubled Lancashire theme park and hotel has been put into receivership. 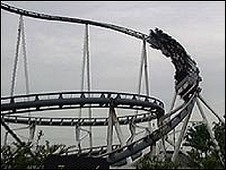 Camelot, which is in Charnock Richard, near Chorley, has struggled to compete with attractions such as Blackpool Pleasure Beach in recent years. Receivers say they are optimistic about finding a buyer for the hotel, but the park looks unlikely to reopen in April following its winter break. Owner Prime Resorts made 18 hotel staff redundant last month. A further 29 jobs are being axed in the receivership. Managers have made no secret of the theme park's problems and have been pursuing plans to close it and build new village on the site. In 2006, Chief Executive Roy Page predicted the park "would not exist much past the next seven to 10 years". Visitor numbers had been in decline at the park, which only operated for 20 weeks out of the year. The theme park, which employed 21 permanent staff during the winter months, was due to open on 4 April. The hotel employs 80 staff. Discussions are ongoing as to the future of the site, receivers Grant Thornton said, including the new village proposals. Les Ross, a partner in Grant Thornton, said: "Camelot Theme Park has struggled for a number of years to compete with larger attractions such as Blackpool Pleasure Beach and Alton Towers. "Visitor numbers had been in decline at the park, which only operated for 20 weeks out of the year. "The hotel had an extremely busy Christmas and New Year and also has very healthy bookings for functions and short leisure breaks. "However, it has suffered a significant reduction in corporate bookings due to the economic downturn. "We are optimistic about finding a buyer for the hotel, which will remain open for business as normal."